There’s so much more to garlic than cooking and vampire slaying. 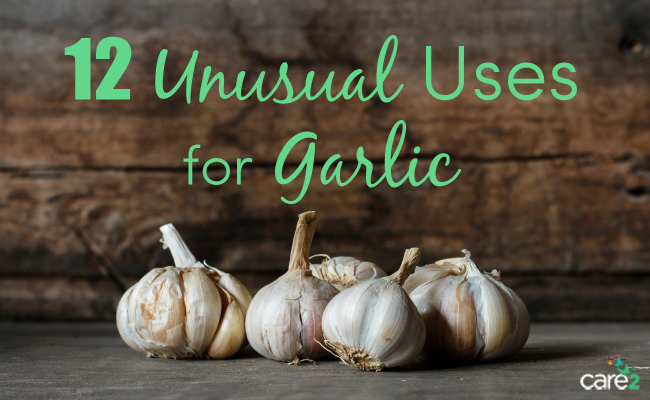 From treating cold sores and athlete’s foot to repelling mosquitoes and repairing glass, click through for some clever ways to use garlic. 1. Maintain Good Health. With properties that are thought to help your heart and liver, boost your metabolism of iron, prevent cancer, and fight against bacteria and viruses, garlic is a vital component of a healthy diet. Try to eat one or two cloves every day! 2. Cure a Cold. For thousands of years, garlic has been known as a treatment for coughs and colds. And, while the science isn’t all there yet, limited research has suggested that garlic will help treat and prevent these wintertime ailments. Mince a clove of garlic and steep it in hot water for about 5 minutes. Strain out the garlic and drink. It’s a natural cough syrup! You can also try to eat 3 raw cloves a day around cold and flu season to prevent catching a bug. 3. Get Rid of Acne. Cut a clove of garlic in half and rub it over the affected area. Done regularly, the antibacterial properties found in garlic cloves will help to clear up your complexion. 4. Treat Cold Sores. Like in treating acne, cut a clove of garlic in half and apply it directly to the sore. It might sting a little, but it’s been shown to work just as effectively as commercial treatments for getting rid of those unsightly sores. 5. Treat Athlete’s Foot. If there’s anything garlic doesn’t like, it’s fungus, so treating your athlete’s foot with the stuff works wonders! Crush a couple of cloves and toss them in a foot bath filled with warm water. Soak for about half an hour. 5. 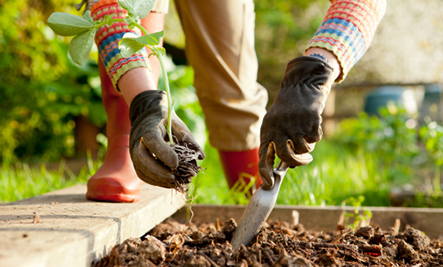 Use as a Pesticide in your Garden. 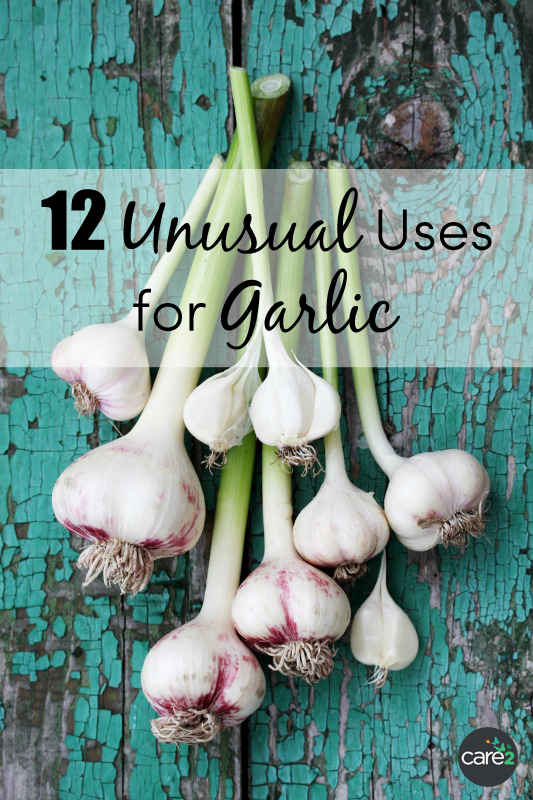 Skip those harmful commercial pesticides and use a natural, DIY method with garlic instead! Click here for instructions. 6. Repel Mosquitos & Other Insects. We all know the best way to kill a vampire — garlic. But do you know why? Well, one major theory is that, like vampires, blood-sucking mosquitoes are afraid of garlic. You can rub garlic on your skin to ward off mosquitoes, if you like, but you can also leave out cloves of garlic in areas where mosquitoes flock. 9. 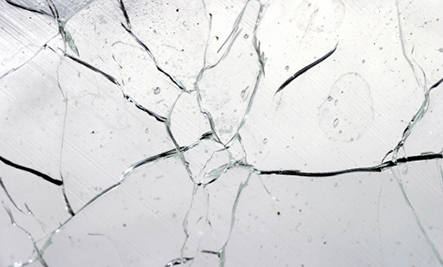 Repair Glass. Think of this as a quick fix for mildly-damaged glass—rub the sticky juice of a crushed clove of garlic onto the hairline cracks, wiping away an excess liquid. Garlic is a natural adhesive, so it’ll help the glass to stay together and prevent any further damage. 10. Use as a Glue. On the same note, you can use garlic in place of glue for other things, such as paper crafts. 11. De-Ice Surfaces. In a pinch, garlic salt works wonders in de-icing roads, sidewalks, and other surfaces. 12. Make a DIY Surface Cleaner. Chop up a 3-4 cloves of garlic, and toss them in a spray bottle filled with white vinegar. Add a couple drops of lemon oil and voila—you have yourself a DIY disinfectant spray!